The Spill Canvas Biography, Discography, Music News on 100 XR - The Net's #1 Rock Station!!! 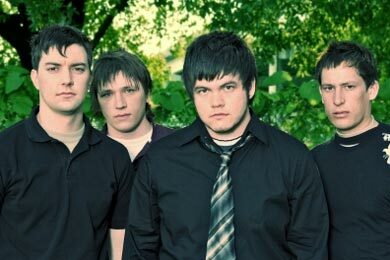 The driving creative force behind the Emo Alternative-Rock act The Spill Canvas, singer+songwriter Nick Thomas was born in Sioux Falls, South Dakota USA, on May 25, 1984. Thomas released his first CD when he was 15 and played relentlessly in various incarnations around South Dakota before starting to perform as The Spill Canvas. A demo sent in by his father caught the attention of One Eleven Records founder Brad Fischetti, who signed Thomas purely through the strength of the tape. The largely acoustic "Sunsets And Car Crashes" was released in April 2004 and promptly became an underground success, selling over 10,000 copies and earning high praise from kids and critics alike. 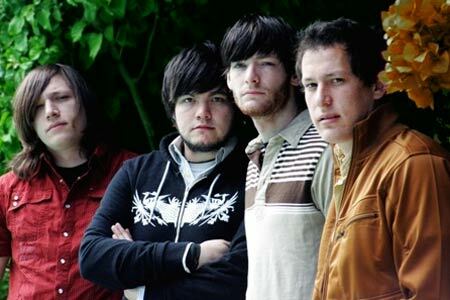 Constant touring, including a string of dates with Straylight Run, perfected his highly emotional live performance and evolved The Spill Canvas into a full band. Joined by guitarist Dan Ludeman, bassist Scott McGuire and drummer Joe Beck, Nick Thomas headed back into the studio to cut "One Fell Swoop", a second full-length disc which was due out in August 2005; it leapt into the top 50 of the U.S. Independent Albums chart. In 2007 the band signed to Sire Records and bassist Scott McGuire left the fold; Landon Heil was pulled in to fill the void. That October The Spill Canvas put out its third album, "No Really, I'm Fine", which contained their most popular single: "All Over You", the song peaked at #18 on The Hot Adult Top 40 Tracks list.